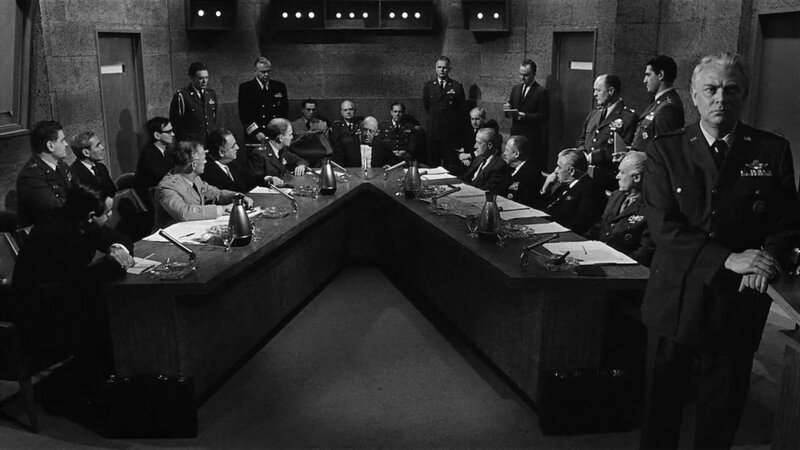 PHX Film Collective will be showing Stanley Kubick's Dr. Strangelove, Or: How I Learned to Stop Worrying and Love the Bomb on Saturday, July 14 at 7:30 at Changing Hands Phoenix. PHX Film Collective member Jeremy Carr writes about Strangelove's more serious companion piece, 1962's Fail-Safe. Jeremy Carr teaches film studies at Arizona State University and writes for the publications Film International, Cineaste, Senses of Cinema, MUBI/Notebook, Cinema Retro, Vague Visages, The Retro Set, The Moving Image, Diabolique Magazine, and Fandor. Working off a screenplay by Walter Bernstein, a previously blacklisted writer who had recently contributed (uncredited) to the Western classic The Magnificent Seven (1960), the fundamental premise of Lumet’s Fail-Safe is indeed rather similar to Kubrick’s comedic masterpiece. Here, after a false alarm signals the presence of an unidentified aircraft in American airspace, a computer malfunction results in an order of attack getting passed on to a U.S. bomber group, their sights fixed on Moscow. Soviet technology jams communication to the crew, thus preventing word of the error, so a roster of politicos, advisors, military men, and the president of the United States are left scrambling for a solution. How do they prevent a strike that would most certainly trigger all-out nuclear war? Painful, sacrificial compromises are made, but there is no happy end for anyone involved. Now, while Dr. Strangelove likewise concludes in catastrophic, combustible fashion, it doesn’t compare to the tragic finality of Fail-Safe, and the formal and tonal constitution of Lumet’s picture is also markedly distinct. Starting with an opening nightmare sequence, depicting a recurring dream that haunts Dan O’Herlihy’s pilot General Black, Fail-Safe etches its narrative with stark, somber intensity. For Black and most others in the film, the threat of nuclear warfare is a potent force, resulting in evident inner torment. “Most” others because a man like Walter Matthau’s Dr. Groeteschele approaches the subject with a cool, detached pragmaticism, perversely reveling in the theoretical possibilities of an apocalyptic scenario. His ideas, he says, are simply hypotheses, but they’re nevertheless “fun to play around with.” In this individual dichotomy is where Lumet develops a delicate balance between Fail-Safe’s emotional core, its humanity, and the almost clinical remove of procedural, mechanical engagement. Mankind has done its best to foster a successful strategy, to implement checks and counter-checks, and to put into place complex mechanisms and rudimentary codes to fortify the safety of this perfunctory system. And to show this, as Kubrick does, Lumet illustrates his film with meticulous attention to detail, from multifaceted contraptions to precise protocol, but this emphasis simultaneously leads to one of the key differences between Fail-Safe and Dr. Strangelove. While the predicament of the latter film is largely the result of idiosyncratic madness, the dilemma of the former is basically reduced to the dehumanized, automated nature of modern combat. Fail-Safe is shot and acted with subdued rigidity (a contrast to the madcap Dr. Strangelove and its spontaneous, behavioral goofiness), and nowhere is this approach seen to better effect than in the exchanges between Henry Fonda’s President of the United States and Larry Hagman’s American interpreter, as the two try to reason with the Soviet premier. Having already worked with the popular, even-tempered actor before, on his first and second films as director—12 Angry Men (1957) and Stage Struck (1958)—Lumet’s casting of Fonda as the president proved ideal for Fail-Safe. The star’s calm and collected decency provides a measure of consolation within the film’s dire and dour innerworkings. Often carried in extended single takes, in a static two-shot, these persuasive, diplomatic sequences encapsulate the film’s conjoined focus on desperation, intelligence, and the refreshing composure of professional competency. Not unlike Dr. Strangelove—though with obviously differing intent—Fail-Safe is heavily dependent upon well-acted scenes of dialogue-laden interaction, and the precarious back and forth between the president and his combative Soviet counterpart is accordingly interspersed with sincere assurances and a subtle nod to the nuances of political barter. Tension mounts throughout Fail-Safe, derived from broad Cold War hostilities and in the more intimate moments of ethical and professional quandary. As a litany of “what-ifs” are bandied about, the sad fact of the matter is that lives, innocent lives, are bound to be lost no matter what, and even more will be put in jeopardy. Lumet progresses the picture with increasing doses of enemy speculation, top secret turmoil, and a breakdown of preventative administration. Objectively and practically, he constructs a visual tightening through his use of constricted locations and fixed camera positions; the frame is theatrical and claustrophobic. With little on the soundtrack save for a few industrial mummers and piercing electronic howls, Fail-Safe generates a palpable sense of panic, enhanced by rapid cutting and a refined countdown to annihilation. Lumet counters this austere aesthetic with trifling asides, as when Fonda muses about the weather outside, saying it had earlier looked like rain and reminding the confined viewer that life is still going on for an unknowing populace. While it’s true Fail-Safe’s thesis is given a rather preachy, expository treatment, and some argued the technology depicted was in fact outdated even by the time the film came out, the equilibrium of autonomy and dependency, of responsibility and remote reckoning, remains a vital and all-too-relevant factor in contemporary conflict. For all it has in its favor, though, Fail-Safe struggled when it finally premiered. Opening months prior, Dr. Strangelove was a well-received, commercial, and critical triumph, and its popularity, to say nothing of its comic achievement and its accompanying controversy, proved a tough act to follow.